After suffering from two weeks of gut wrenching food poisoning, Erik is back with a delightfully cute and fun snack called Pucca Chocolate. Will this fun loving snack trick us back to the hospital? The snacks seem to be fish and squid shaped with a chocolate blood center. It looks like some of them were killed with a very small caliber bullet. If we find a small piece of metal in the center, we’ll know. Here's the top of the package. Look! They are "NEW!" And the bottom with expiration date. Ouch... not so new. They expire in May of 2008. Luckily we are on the Godfearing side of the international date line and we have a few hours to polish them off. On the back of the package is... what the hell? Is this some kind of puzzle? Using a decoder ring and the fumes from a few cans of Sterno, we are able to figure out the clues and decode the SUPER SECRET MYSTERY PUZZLE OF WORDS! By now, Erik is high on Sterno fumes and giddy with hunger. A pull and a tug and a rip and a tear. A hammer blow should reveal the innards! I'm starting to think that the hole is used to blow air inside the fish to ensure that as much chocolate as possible is forced out. Before we could eat any of the fish, Stephanie had an idea. "Let's put the fish in it's natural habitat and see if it comes to life!" then pulled it out and tossed the gross soggy bit to leave the chocolate center behind. We realized that was a complete waste of time and begged Erik to eat the fish. Next week, we'll travel to Egypt and see what American foods taste like overseas when they are made in America, shipped overseas, purchased at an airport and then flown home to be digested. Was it a pretzel-y outside shell...or a cookie-like fishy body armor? I’m just guessing here, but it looks like Stephanie may be questioning her choice of careers. You must've been really bored at work that day. P.S. 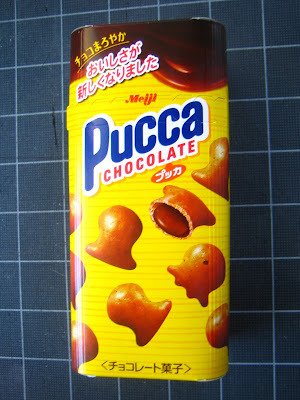 did you get Pucca snack from the Dollar Store? I'm stocking up on these before we leave Japan. These and the chocolate mushroom trees.